Do you recognize that guy in the photo above? (No, I’m not talking about Mike Trout high up on the wall in the background.) That’s my friend and fellow ballhawk Devin Trone. 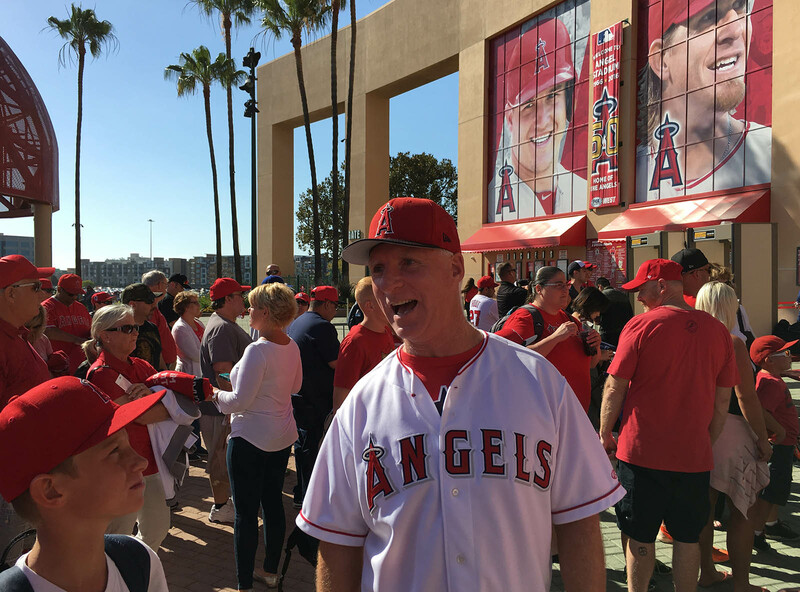 Whenever I attend games in Anaheim or Los Angeles, he’s there — same deal with Home Run Derbies and All-Star Games — so it was nice to catch up with him. After making a quick stop near the left field foul pole . . .
. . . 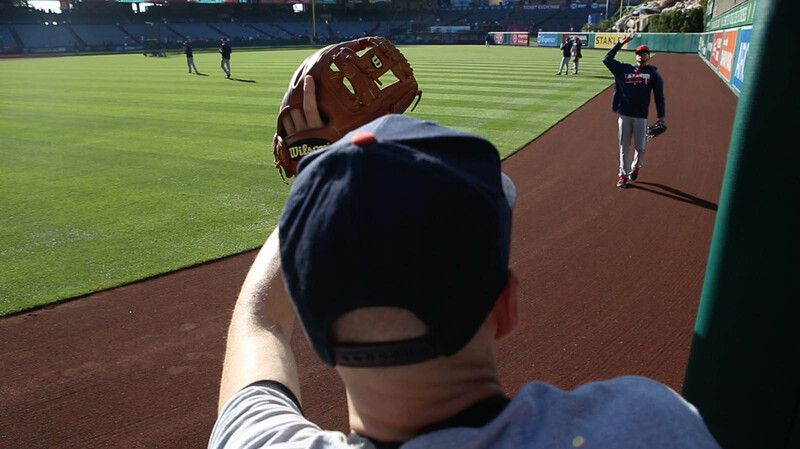 I headed out to left-center field. 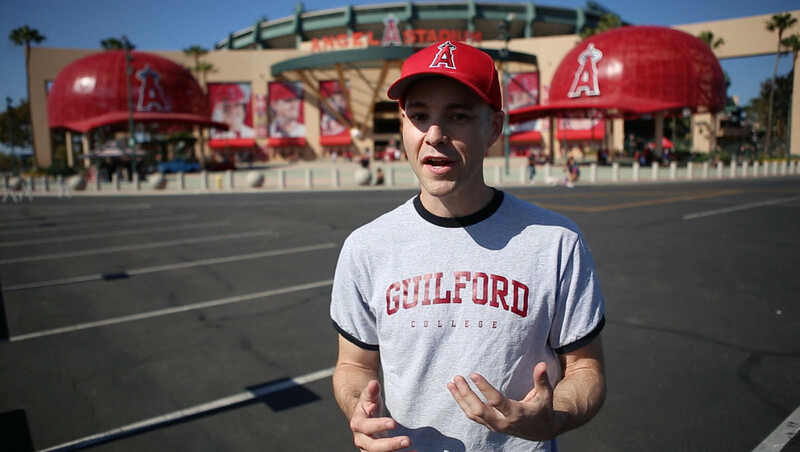 My indecision cost me a baseball. This stadium drives me crazy. 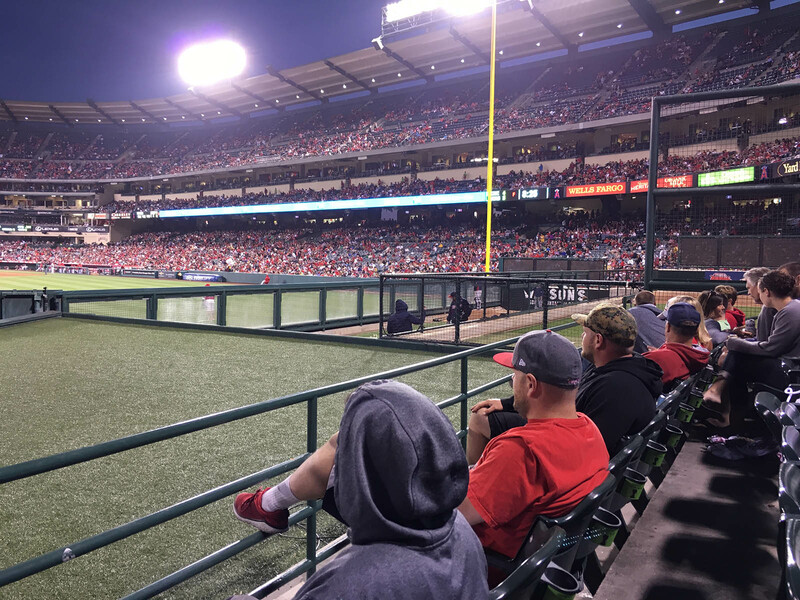 Whether trying to catch a baseball or just watch the game, it’s awfully frustrating when the front row is 50 feet away from the field. Dead space in the outfield is the worst, and this stadium has a lot of it. 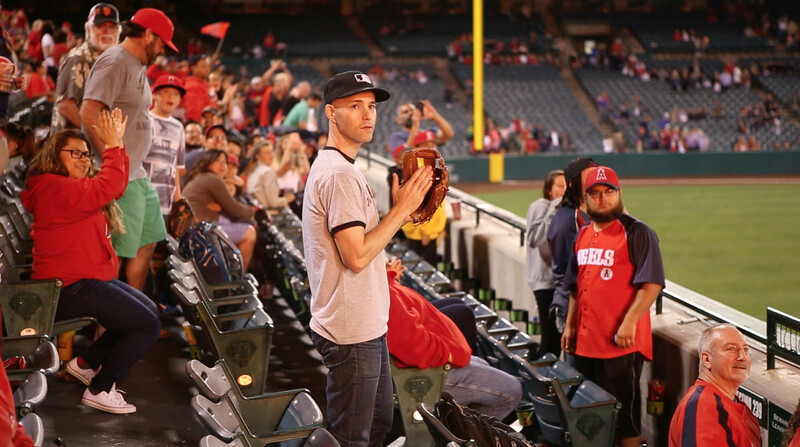 1) I was about eight rows back when I saw the ball get hit in my direction. 2) Judging that it was going to fall short, I ran down to the third row and started moving to my left. 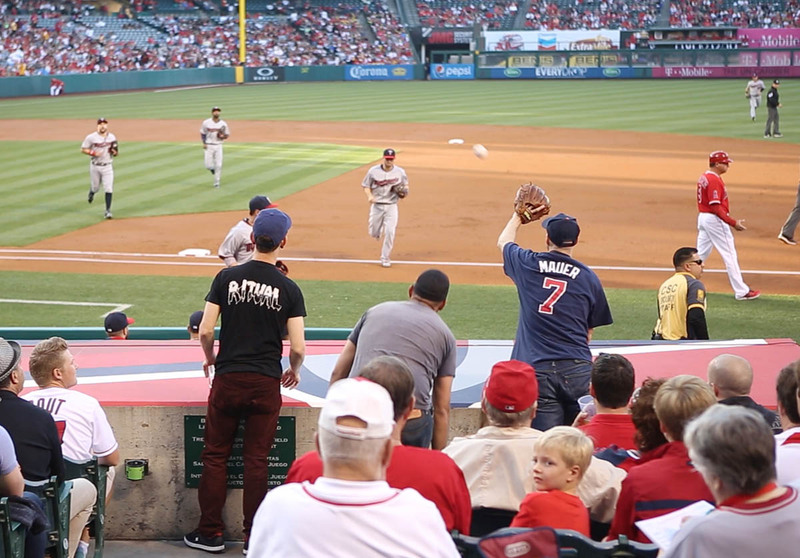 Note how the employee in the red shirt is standing there casually and ignoring the ball as it plunked down beside him. 3) The ball took a massive bounce over my head (see it against the sky?) and landed in the row where I’d initially been standing. Duh. 4) No one else was going for it, but I still rushed to get there and pick it up. Then I confirmed with one of the regulars that it had been hit by C.J. Cron. 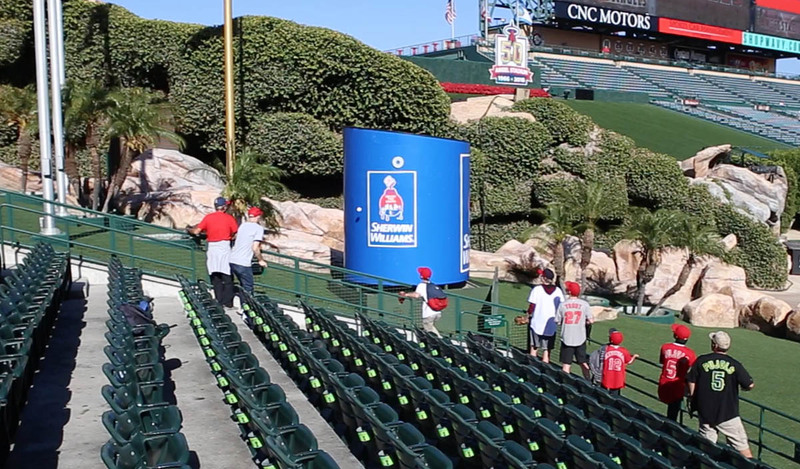 Basically a home run bounced past and barely missed that big blue thing. I was hoping it’d hit the rounded edge and deflect toward me, but no. I’m not sure who hooked me up, and in fact I struggled throughout BP to identify the players. Cool action shot, right? Well, the ball bounced a foot beyond my reach. I’m an idiot. All I had to do was NOT MOVE, and it would’ve been an easy chest-high catch. 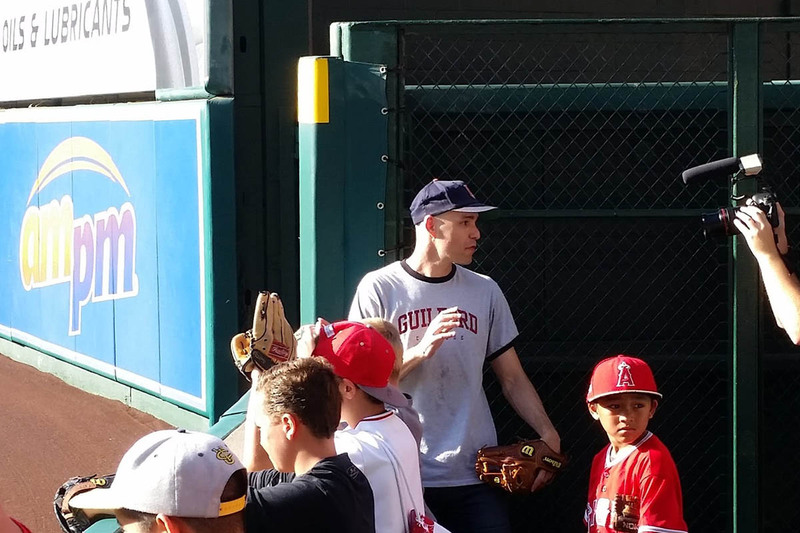 He’d already given baseballs to all the kids down in front, so by the end of BP, he must’ve figured it was time to chuck one to me. I gave that ball to a kid late in the game. They are GREAT guys, and I’m not just saying that because they’d brought two of my books for me to sign. I really had a nice time hanging out with them. And by the way, I need to point out the fact that Boog is close to my age and has a son who’s . . . like, an actual grown-up! That’s just weird. I can’t imagine having a kid right now (hopefully someday) let alone one who’s old enough to grow facial hair. WTF. My dad was 51 when I was born. I wonder what it’s like to have a father who’s so young. After a quick peek at the Big A . . .
. . . it was game time. My seat was behind the Twins’ dugout . . .
. . . but I didn’t really want to stay there all night. 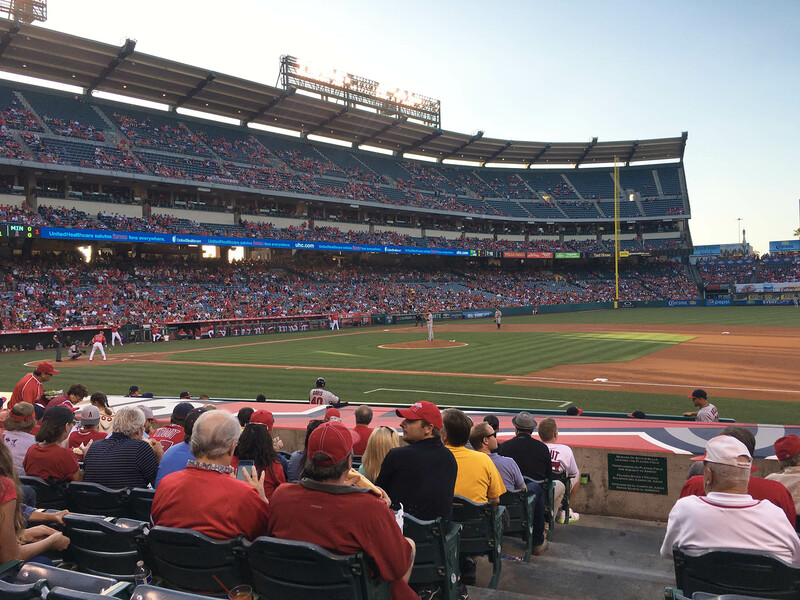 I think it’s dumb to sit in foul territory when Mike Trout and Albert Pujols are in the starting lineup, so I decided to stay there until I got a 3rd-out ball, and then I’d think about heading elsewhere. 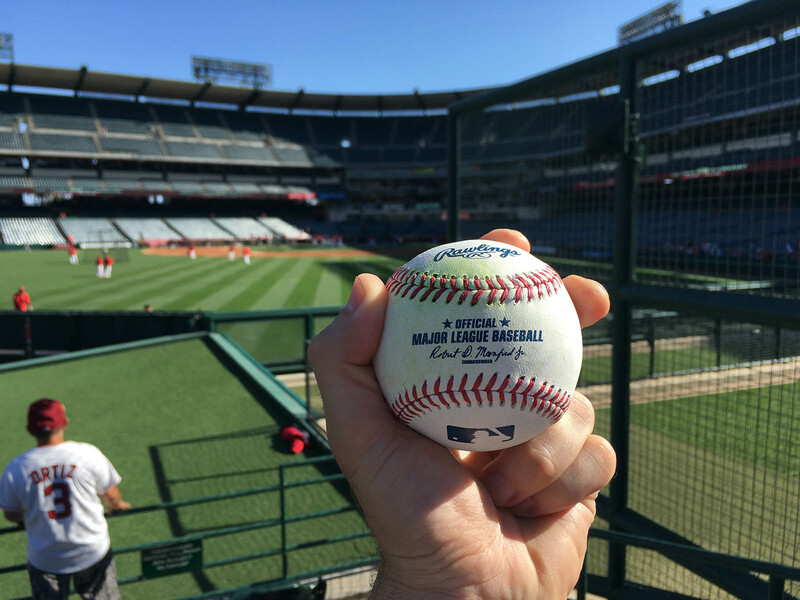 Someone told me later that a game-used ball hit by Mike Trout — even a ball that resulted in an out — is worth hundreds of dollars. I suppose that’s true, but it didn’t occur to me at the time, and I don’t care. 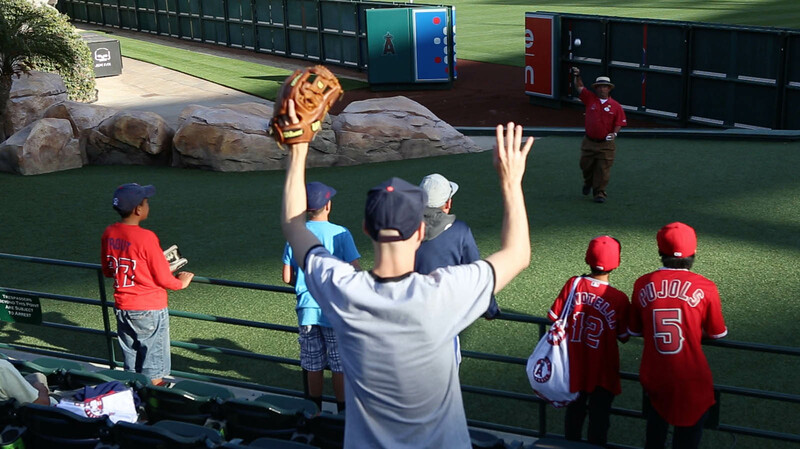 Quite simply, it was fun to snag that ball after the 1st inning, and it also felt good to give it away to a young fan. Those guys in the front row ended up recognizing me and admitting that they, too, didn’t have tickets for that section. People often ask me how I’m able to move around during games, so that’s how. In certain sections in certain stadiums, it’s simply not an issue. 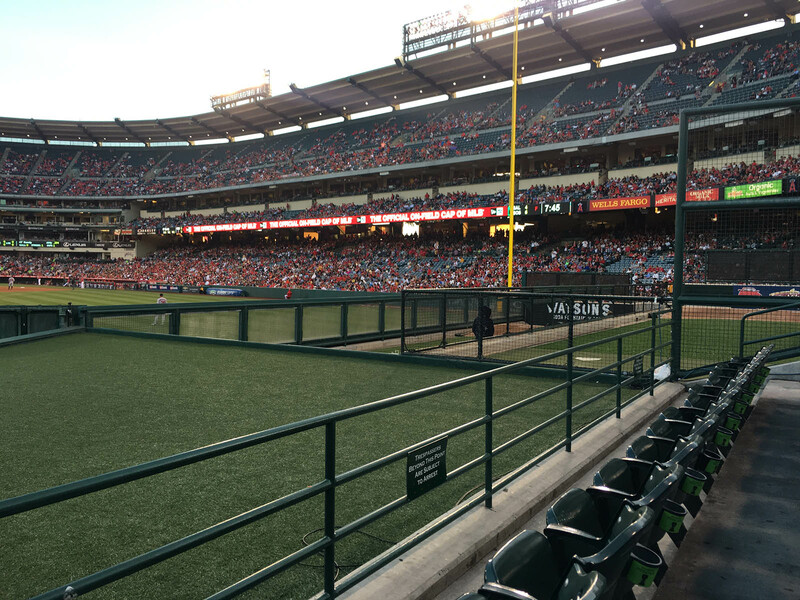 The ushers WERE closely guarding the dugout seats (one guy rudely denied me on the 3rd base side when I was hoping to say hello to Mike Trout before the game), but 430 feet from home plate in a section with a lousy view? No one cared, and that’s how it should be. 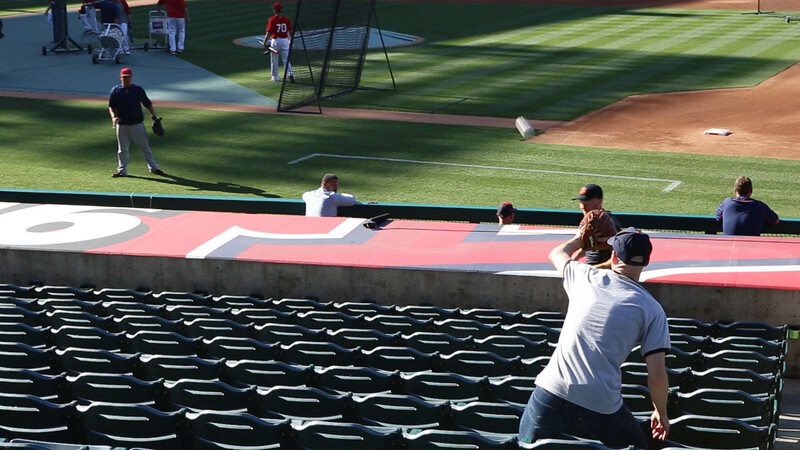 If you look closely at the screen shot above, you can see Jonathan filming himself making the catch. 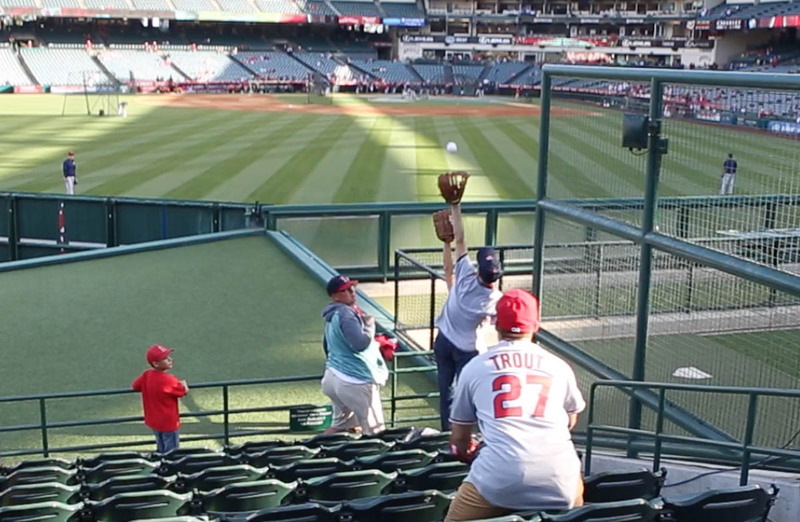 I said that Calhoun and Trout throw the balls to people with those nets, but sometimes their aim is a bit off. I think that looks snazzy. From a numbers standpoint, it was kind of a blah day. 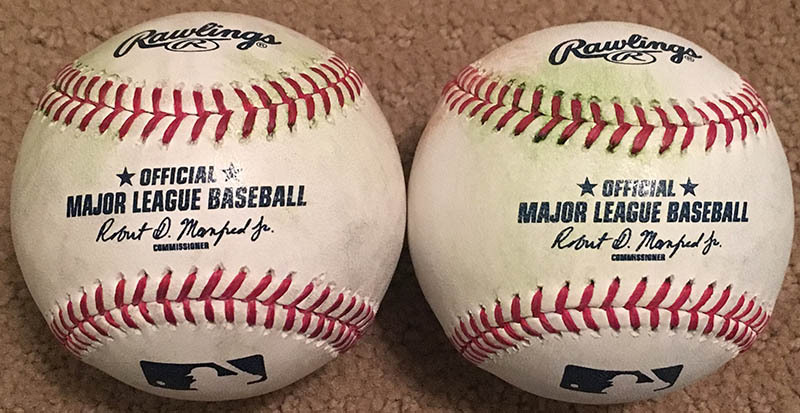 I’ve been averaging more than eight balls per game this season, so to “only” get five was a bummer, especially when I was being filmed and hoping to put on a good show. 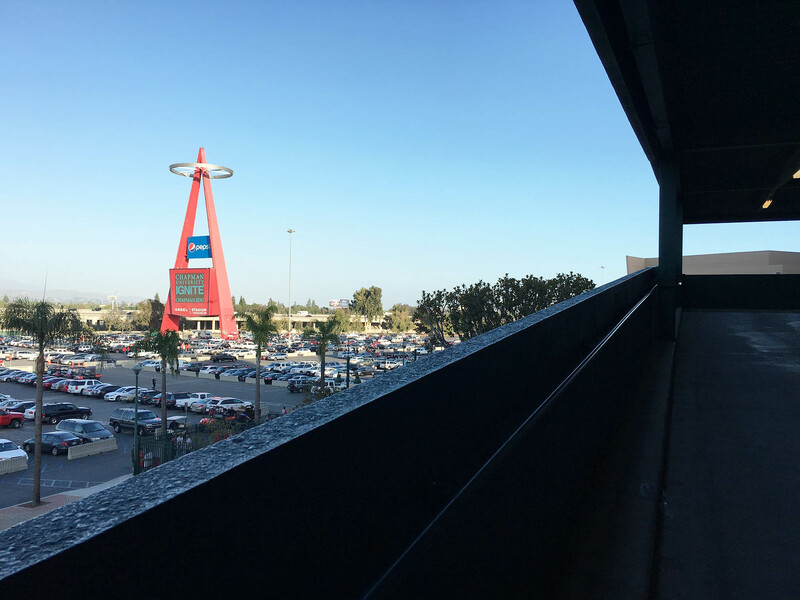 Angel Stadium is a difficult place to catch baseballs, but I still could’ve hit my average with a bit more luck and a less stupidity. 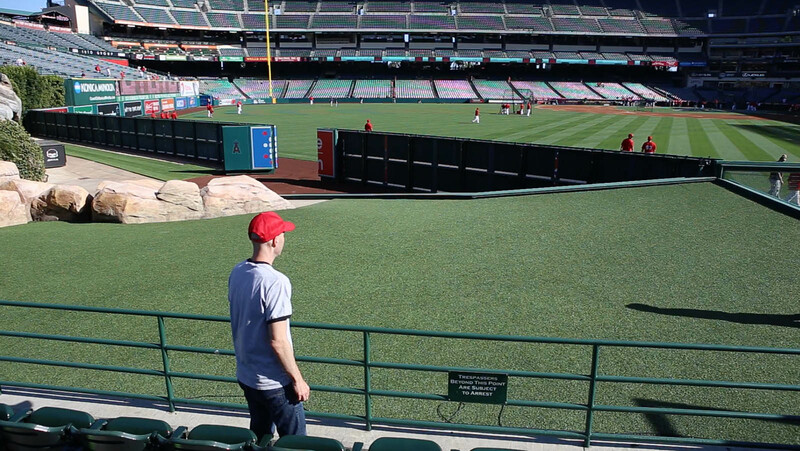 If I had headed directly to straight-away left field upon entering, I would’ve gotten a home run that landed in the back bullpen and bounced into the seats. If the home run just beyond the outer edge of the seats had clipped the blue/rounded Sherwin Williams ad, it would have deflected to me. 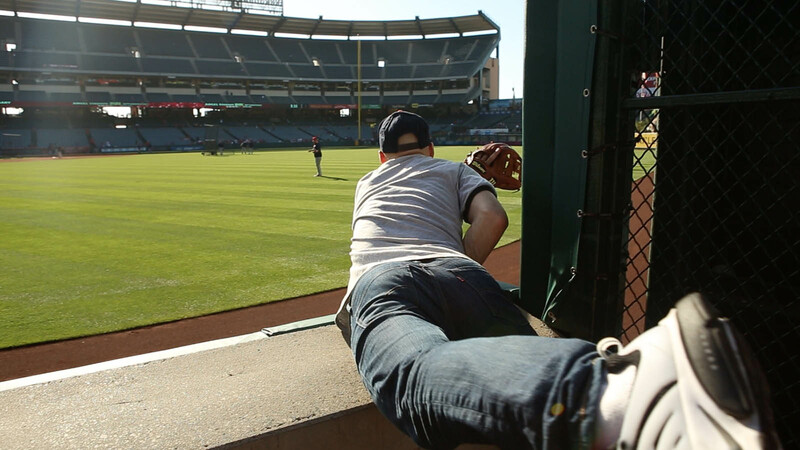 Then there was the ground-rule double in right field that eluded my glove by about a foot. 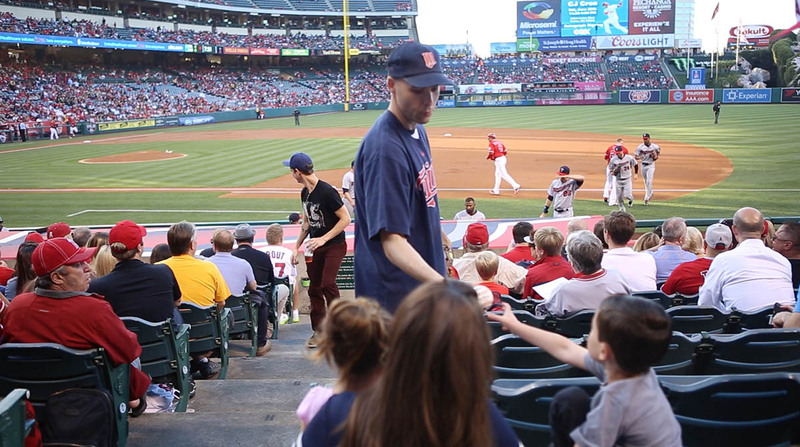 There was also the ball that I misplayed back in left-center by drifting down the steps. 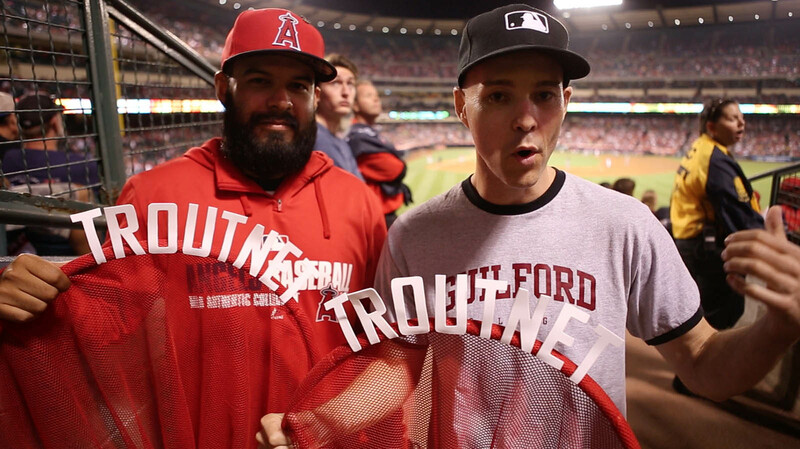 And finally there were a few close calls with the TROUTNET late in the game. 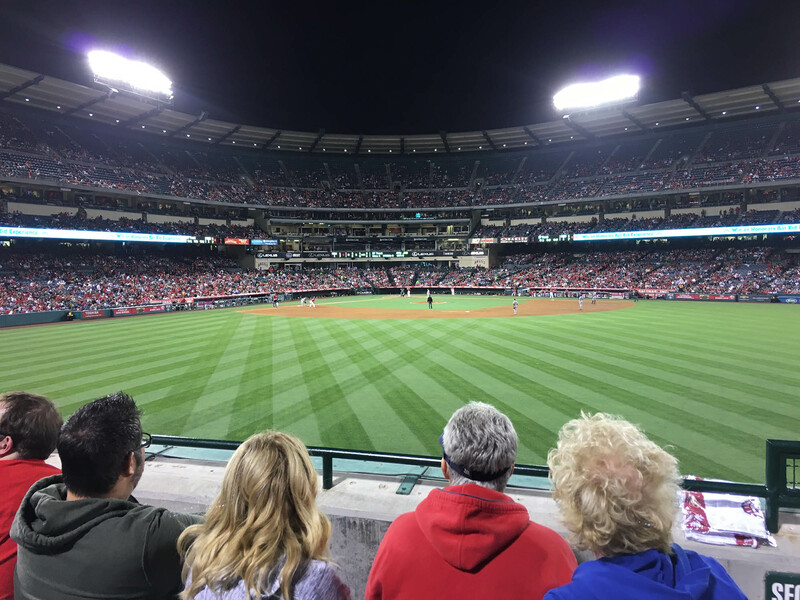 I don’t think I could’ve reached double digits (well, maybe I could’ve if I went for pre-game balls near the bullpens and/or along the right field foul line and then tried to get a ball after the game near the dugouts or bullpens), but I clearly underperformed. By saying all of this, I don’t mean to complain but rather demonstrate how there were a bunch of woulda/coulda/shoulda moments. That’s often the case, but there seemed to be more of them at this particular game. Oh well. It was still a fun day. The video is still being edited. Subscribe to my YouTube channel and/or check back here for an update. I’ll add a link when it’s ready. • 383 balls in 46 games this season = 8.33 balls per game. 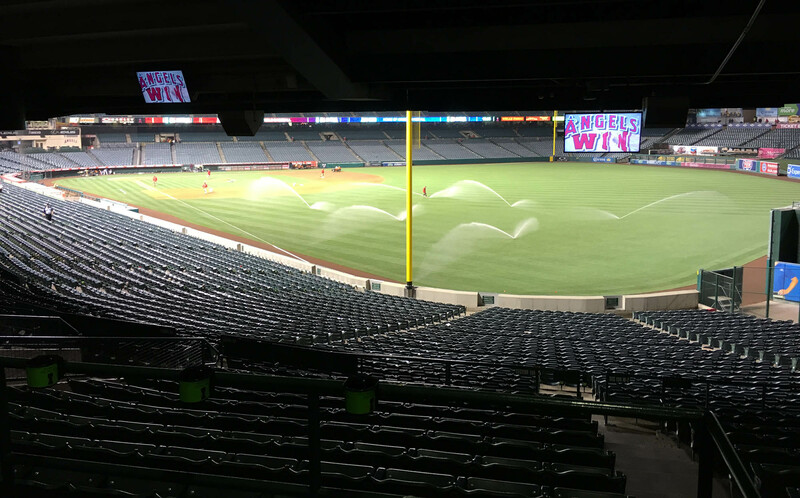 • 44 balls in 7 lifetime games at Angel Stadium = 6.29 balls per game. I caught Luis Valbuena Home run Ball July 24 game against the Astros when Astros beat Angels 13-3!!! Congrats! That dude has tremendous power. 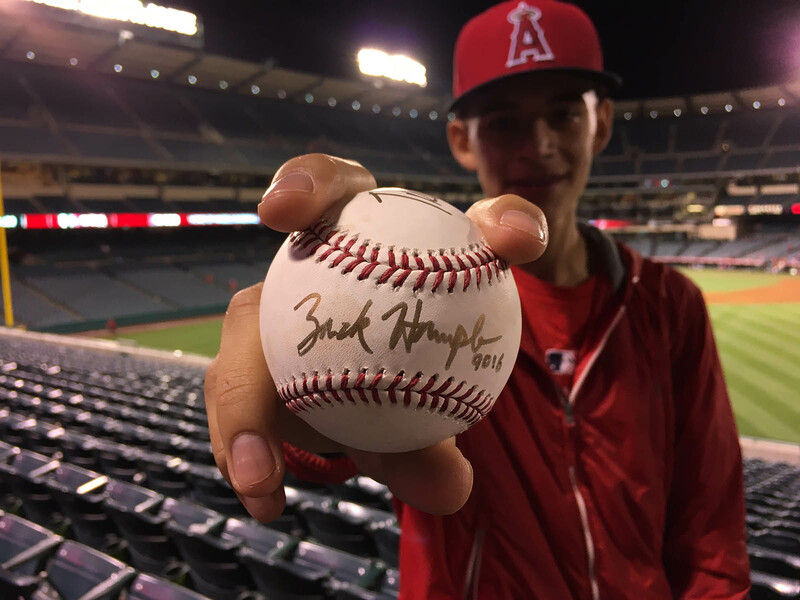 You know, it does my heart good to know that most of the names of angels players you mentioned Zack I probably saw in Triple-A. I believe the player who hooked you up in the picture from the Twins was Juan Centeno. Sorry, I can’t make it. I have other plans here in NYC. Thanks for letting me know. Wanna take another look when the video is done and then confirm it for me? I will,be at the phillies game on August 20th, is there a chance you will be there? I don’t think I’ll be there that day, but I’m still trying to make plans for August and September, so who knows? Going to be in Minny or KC this year? Not sure. I’d say there’s a decent chance for both, but I don’t have anything booked at the moment. It would be nice to see you again. 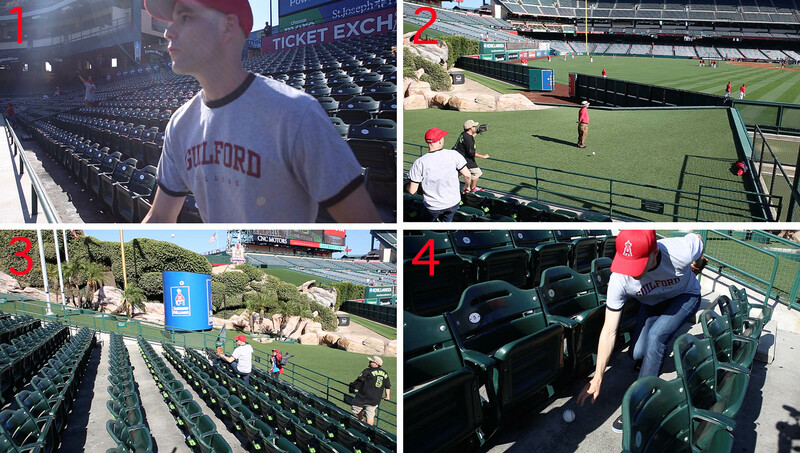 Zack when r u gonna posta new vid on youtube, ps I was just at O.co Stadium and got 3 balls. Hopefully today if my videographer actually does his job. You made my sons day, Bradley. 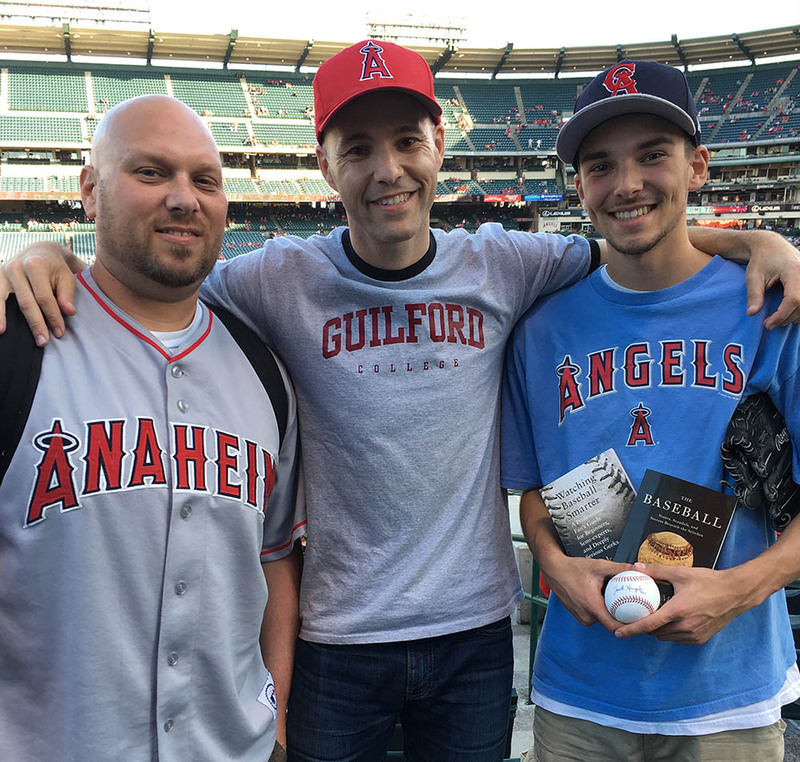 You talked to his mom and then went down above the dugout in Anaheim You introduced yourself and signed a ball for Bradley. He was so excited. Certainly a huge fan. We love baseball. Thank you for the memory! I’m so glad to hear that, and you’re very welcome! Hi zack I was at your book store the other day and really liked it I really want to meat you one day at a yankees game or in new york city. I have watched all your you tube videos and will continue to. Please let me know the next time you will be at a yankees game I would love to meat you. Hey! Thanks for watching the vids and commenting. Not sure exactly when I’ll be at the stadium, but I should be there for a lot of weeknight games this year. Hopefully see you there. Hey Zack. As usual, great entry! 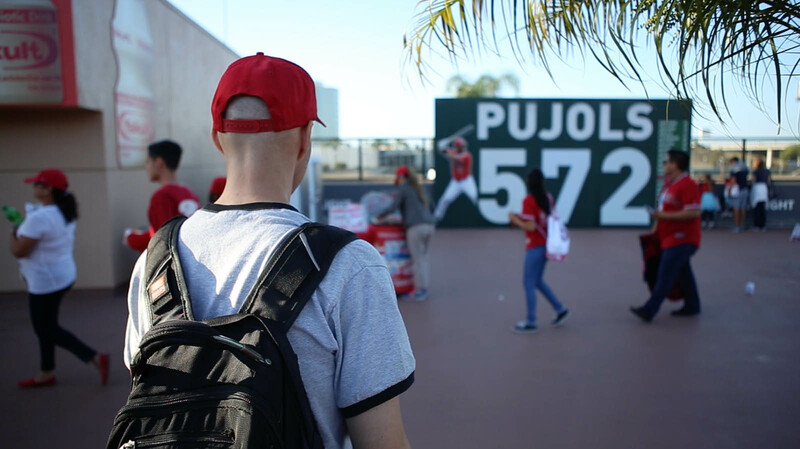 Isn’t funny how you photographed the Albert Pujols home run total in this entry that it was against the Twins. 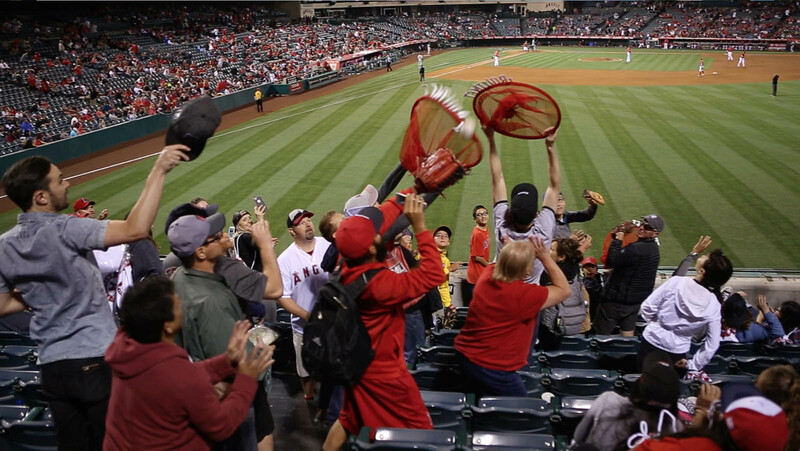 Almost a year later, he hit his 600th home run against the Twins…in Anaheim. Also, the score of this game was 10-2. 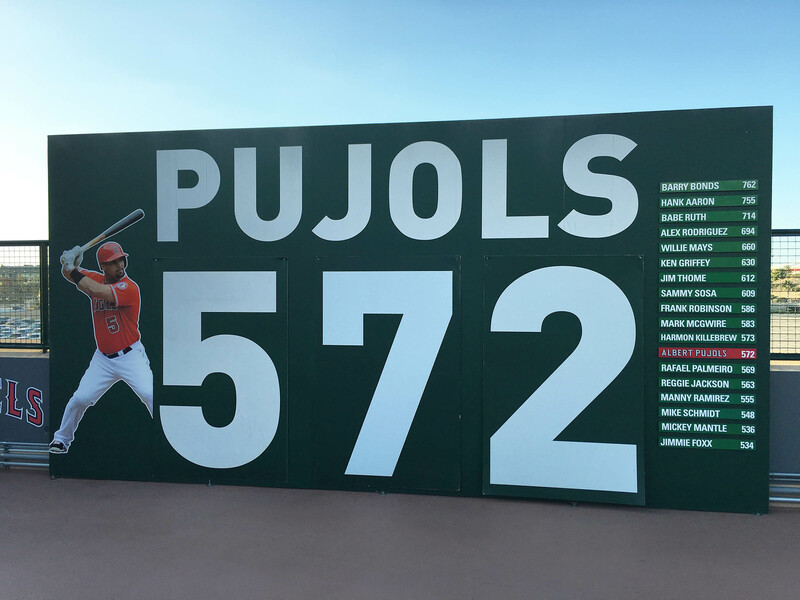 The score of the game where Albert Pujols hit his 600th home run, the score was 7-2. Mike Trout scored three runs in the game that this entry refers to, and he wasn’t in the lineup when Albert Pujols hit his 600th home run. (10-3=7). And finally, the home run total in this blog was 572. 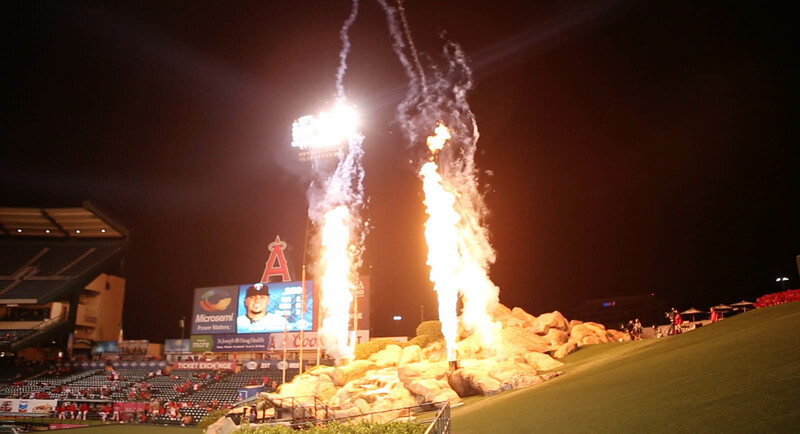 (Pujols = #5, and the score was 7-2 when he hit his 600th home run.) I literally thought of this in 5 minutes. Is that stretching it? I hope not.